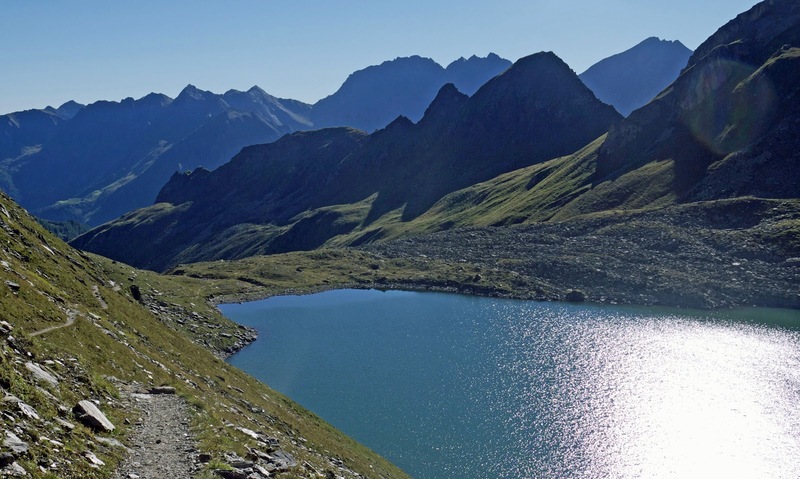 Just back from 26 wonderful days walking along the Via Alpina through Austria, Germany and Italy. Everything "self-organised", it was another example of how rich the walking experience is in Europe and how lucky we are to have such accessible trips on our doorstep. The only thing that surprised me was the fact that we only met one other person from the UK on the whole trip. 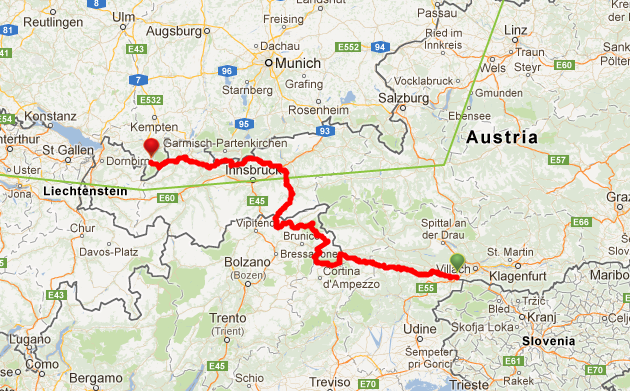 We first decided to walk the Carnic Way -155 kilometres along the Italian/Austrian border from Sillian to Arnoldstein. 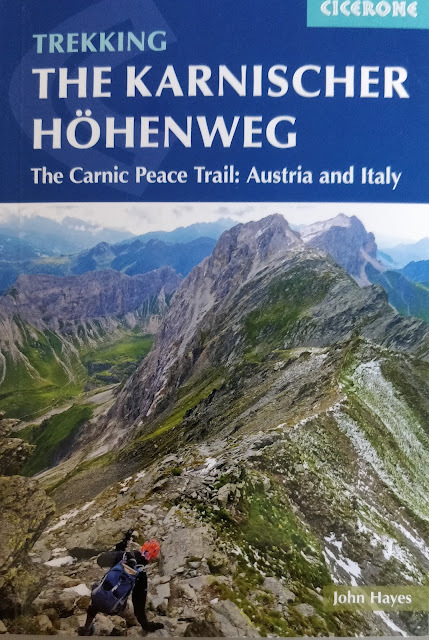 When we were in Austria last year it was the one walk which everyone we asked told us to do - and given the rich choice Austrian walkers are faced with, this was a powerful recommendation. The only things we had to decide on were which way (east to west or west to east), and how much walking to do. We had a four week window (between the end of the Olympics and Christine's work commitments); the Carnic Way takes about 8 days so we could add a lot in either direction. Tipping the decision in favour of west to east was the experience of walking in Bavaria last year. There were lots of trees in Bavaria and this year I wanted to get higher above the tree line. I was worried that an 18 day eastern approach to the Carnic Way, either on the Via Alpina from Trieste or along the Slovenia / Austrian border - 03 SudAlpenweg long distance route - would involve a lot of walking through trees. On the other hand an approach from the west on the red variant of the Via Alpina would take us through the heart of Austrian Alps and because it was higher the vews should be better. We decided to go west to east and I think this turned out to be the right decision. The itinerary was based on timings from the wonderful Via Alpina web-site. I planned a series of days between 7 and 9 hours, shorter on average than my E4 trip, and combined stages where I thought we could walk further than the Via Alpina recommendations. It all worked a treat. The Via Alpina timings proved realistic, an excellent basis for itinerary planning and (unlike my recent trip to the Vercors) we were always where we expected to be. The trip took me (Christine joined at Scharnitz) from Oberstdorf near the border with Germany in western Austria, along the border with Germany (crossing the border several times), south across Austria, and then along the border between Austria and Italy to the point where the border hits Slovenia. We had hoped to walk for 27 days but lost a day and a half to the weather, although generally speaking the weather was much better than last year. The trip in total was 530 kilometres long and involved 32,000 metres of climb. Accommodation was either in small hotels or guesthouses down in a valley or in "huttes" on top. 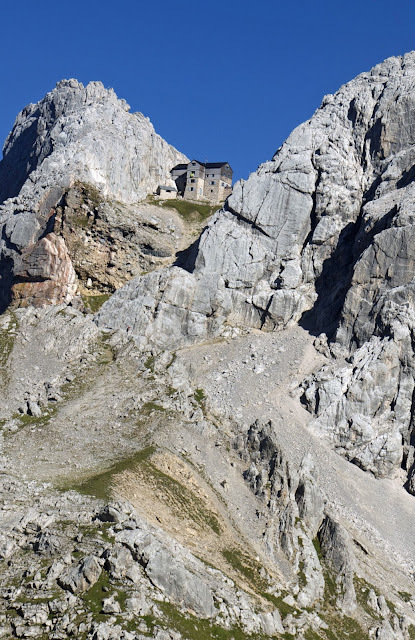 The huttes (or refugios) were generally run by the German, Austrian and Italian Alpine Associations and by joining the Austrian Alpine Club we qualified for a discount on accommodation (not the food). It's well worth joining and the membership fee is easily covered by savings on travel insurance. 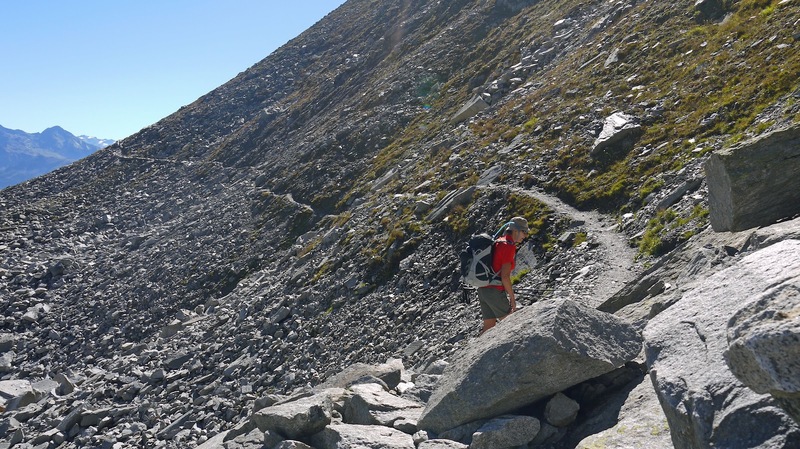 Because our original objective was the Carnic Way, I hadn't given much thought to the 18 days walking required to get there and, believe it or not, didn't really have any expectations. The walking was great, challenging but nothing too intimidating. It certainly made me think about the choice I made last year on the E4 : perhaps I should have taken a couple of weeks longer and done the high Alpine rather than the sub-Alpine route through Bavaria. What made it special was the altitude. If you're staying in a hutte it's because you're staying high and in the first 17 days of walking I stayed in 9 huttes. 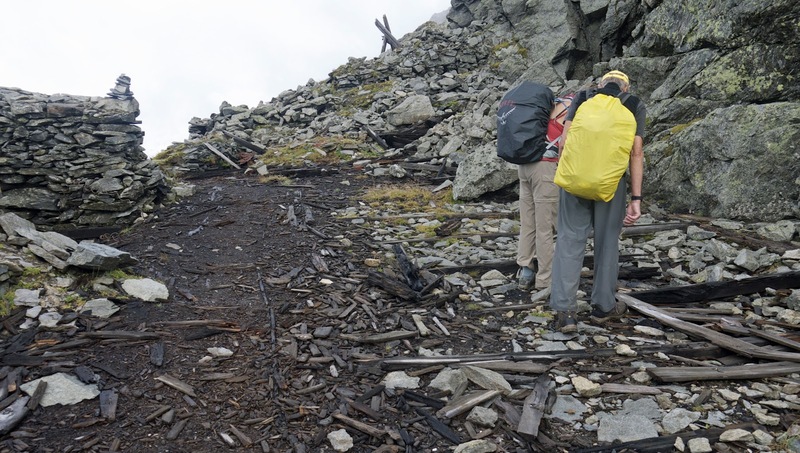 There was still a lot of ascent and descent but the retreat to a valley-bottom a hotel only happened every 3 or 4 days. Of course there was a downside to this _huttes are not that comfortable and sometimes the noise of snoring makes it impossible to sleep, but the scenery and the location of the huttes themselves are a huge upside. Before the Carnic Alps and the Carnic Way, the Via Alpina from Oberstdorf goes through seven different mountain ranges each with their own personality (Allgau, Lechtal, Wetterstein, Karwendal, Tuxor, Zillertal, and Sexten Dolomites), each separated from the other by a valley (note: no hotel though between the Lechtal and Wetterstein). Typically each range had to be climbed, crossed and descended with the tops around 2,500 metres and the bottoms 1,000metres. You stay in the huttes as you cross the range. In terms of scenery all the days were good and some were just amazing. There were three absolutely standout days, each of which would be in my best day's walking of all time competition. The first involved the walk from Coburger Hutte to Meilerhutte - my Day 5. In terms of the Via Alpina schedule this is two stages bolted together, Christine had yet to join me, and I was up for the challenge of a 10 hour walk with 2,500 metres of climb. The weather was absolutely glorious and hundreds of Germans and Austrians were out sharing what is clearly a well known section of the route. It had everything - a lovely descent from the Coburger Hutte to an alpine lake; a long cool walk up a sheltered valley in the morning sun; after climbing up over the first of three passes, a long stretch across deep green upland pasture; after crossing the second pass into Germany a dry limestone mountainside scrapped bare by a glacier which must only recently have left the scene; a huge descent into a long valley noisy with rushing water; a really tough climb through trees then rope assisted to the day's third pass; another alpine pasture with huge views north to Bavaria and the mountains I crossed last year; and a final climb to Meilerhutte which, in a tight competition, gets the vote for the trip's most dramatically located hutte. The second, this time with Christine, was the walk from Pfitscherjoch to Edelrauthutte - Day 14 of the trip. After loosing height quickly we set off on the toughest challenge of the day, and one of the toughest challenges of the whole trip, the long climb up to the pass at Gliederscharte. Hard work but the views back down the valley and across to the glacier filled world of the Zillertal Alps were amazing. After the pass we were in an upland wonderland of little lakes and alpine pasture before a descent into a valley surrounded by towering mountains. Escorted by a herd goats, and a young German called Bastien, we descended down a steep valley to the little settlement of Duns and a farmhouse lunch. My favourite part though was the long steady climb up past cattle enjoying the last of the summer grazing into increasingly wild and dramatic country, before the final climb up to Edelrauthutte. The third highlight came on Day 15. Although the first part, the descent from Edelrauthutte down to Neves-Stausee and the climb back up to Chemnitzer Hutte, was excellent it was next part - a ridge walk which went on for 15 kilometres - which made the day really memorable. The ridge walk just went on and on. it was quite difficult at first with huge unstable bolders to pick your way across. But after that it was a relatively easy trail contouring high up along the side of the ridge, first one side and then the other, with amazing views in every direction. Initially these views were dominated by the Zillertal Alps looking back, but increasingly it was the dramatic profile of the Dolomites to the south which increasingly grabbed your attention especially, at the western end, the Marmalada with its glacier glinting in the sun. 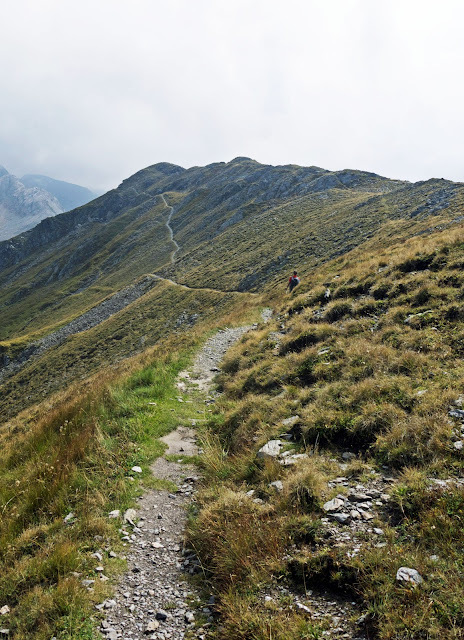 All the standout days had perfect weather and I suspect our trek through the Dolomites from Weissbach to Sexton would have been as good if we had been able to see anything. Although we walked right past them, I have still only seen the Drei Zinnen, perhaps the most iconic view in all the Dolomites, in a photograph. Still we will definitely be going back to have another try - the Dolomites are my favorite part of the Alps. The relatively good run of weather had come to an end by the time we started the Carnic Way, heavy rain had spoilt the walk across the Sexton Dolomites, and the forecast was not good. Despite the weather could the Carnic Way justify all those Austrian recommendations? It's got two really big things going for it. Firstly you stay high for a long time. The Carnic Alps (Karnischer Alps and Karnischer Höhenweg in German) is a long thin range of mountains and much of the walk is along the narrow ridge at the top. Of course you are going up and down all the time but the views along the ridge and to the south into the Dolomites are just amazing. Secondly it's really interesting. The Carnic Way, also known as the "Peace Way" takes you right along the Italian/Austrian border established after three years of hideous fighting in the First World War (1.2 million casualties) - the remains of the conflict, the trench works, remnants of buildings, even personal artefacts are everywhere. The weather was not brilliant and quite often the views were obscured by cloud and mist. It was still great fun, and if the weather had been any better Christine would have stopped to go swimming in every lake and we would never have got to end. Despite comprising a single ridge the landscape was varied with some stretches dominated by granite mountains, the tops of which had transformed by the alpine ice cap, and some made up of the more dramatic limestone scenery, outliers from the Dolomites. Nor was it a gentle contour path. 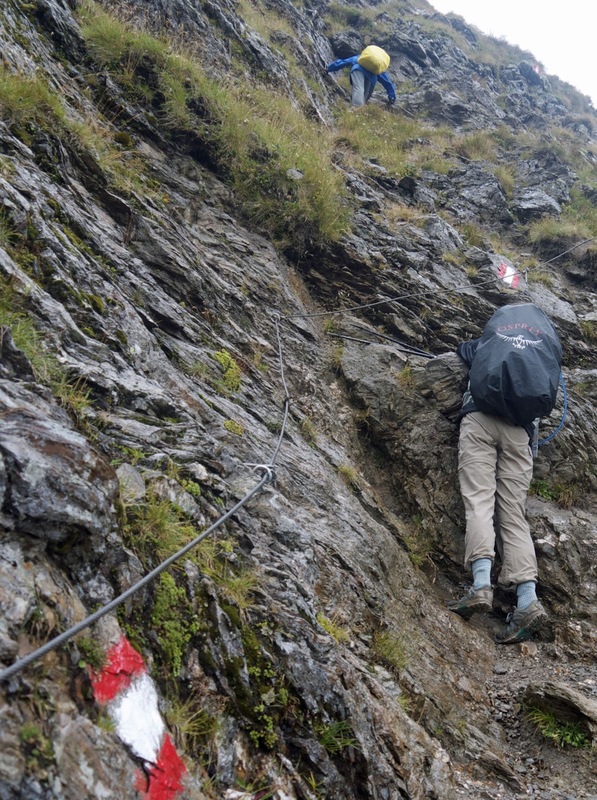 Lots of ascents and descents, lots of mini passes to cross and summits to climb and yes, like a lot of alpine walking, you did need a head for heights and the confidence to pull yourself up the side of a cliff on a fixed rope. Still one of the strongest walkers we met on the route was a retired German doctor who was a bit slower than us but made light of the walk at 79. It took us 8 days to walk the whole of the Carnic Way and we were going a faster than most people on the trail who were nearly all on a schedule published from a German guide book published by Rother. Most of the other walkers didn't bother with the last two days of the walk which were good, just not as good as what had gone before. 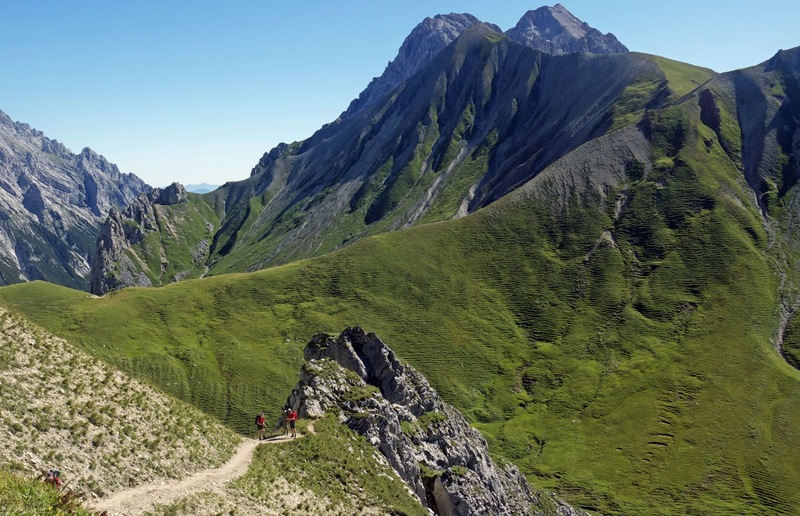 Because you're walking high up, most of the accommodation is in huttes (5 of the 8 days) and because everyone is doing the same walk you're likely to meet the same walkers more than once. We got to Carnic Way in early September after the July / August rush, and were usually able to get a place in the small rooms rather than the larger noisier dormitories. We were told that if we had come a week earlier it would have been very busy. So 26 days along the Via Alpina and it couldn't have been much better. If you're interested in finding out about how it felt at the time than please go to my diary blog entries at the following links. Thanks for posting these reports, they've been a great read, and you've added another route to my to-do list. Greetings from the only Englishman you met on this trip. If you'd like any information about the continuation through Slovenia, please ask. The other trip - Munich to Venice - is described in 28 stages on the website: www.fernwege.de/d/muenchen-venedig/index.html (in German, but chrome browser does a sort of translation). There's a guidebook too. Nice to hear from you and glad to hear you got back safe and sound. Thanks for the Munich Venice link, definitely interested in that, just a question of when - have a ever growing list of things I want to do. The Julian Alps look great as well, maybe a short trip the year after next. Next year is nearly full for me - have ideas for 6 trips. One includes cross country skiing which we talked about. Well done John. What a nice ideas for walking. Thanks again for your writings and experiences that I read with great pleasure and envy. Reiterate Juan's comments - will certainly be looking at the Carnic Way next year. Thanks for the all your writings and inspirational photos. 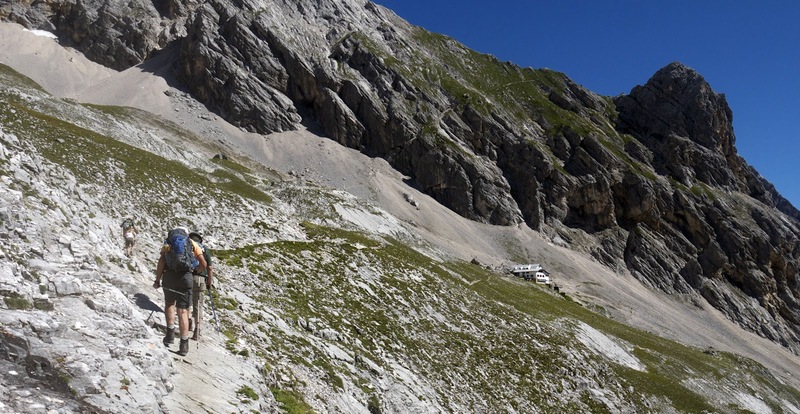 Look forward to connecting the Carnic Alps with the Dolomites - and on to Roverto. Having wandered about in the Julians, I agree that Tarvisio is only a beginning:-) Great stuff!